The job prospects for nursing assistants in the USA are estimated to grow by 11% between 2016 and 2026. Those who have completed an authorized nurse aide training program and successfully, cleared the competency evaluation test can expect lucrative career opportunities in several health care facilities. As per the figures provided by the Bureau of Labor Statistics, the number of certified nurse aides employed in May 2016 was 1,564,300. In present scenario, the career outlook for CNAs is very bright, and these professionals enjoy handsome salary packages and other perks due to their ever increasing demand. 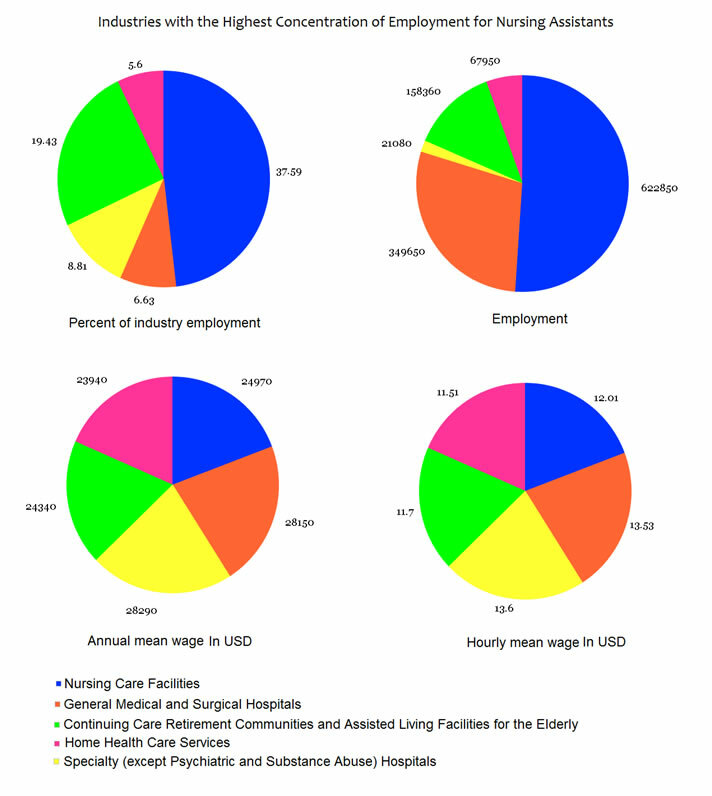 Nursing care facilities offered the highest employment to the nursing assistants while the lowest employment was offered by employment services, in May 2017 (as per the BLS). 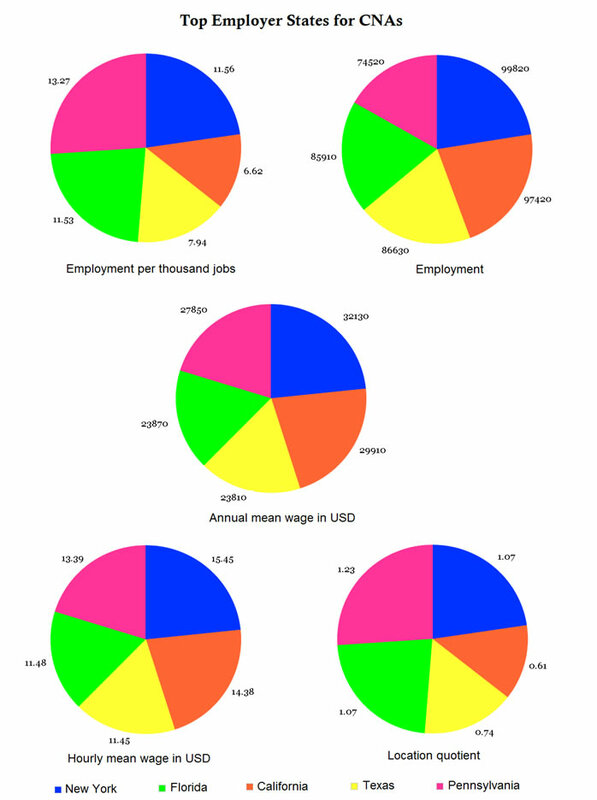 The statistics are shown below with the help of a pie chart. 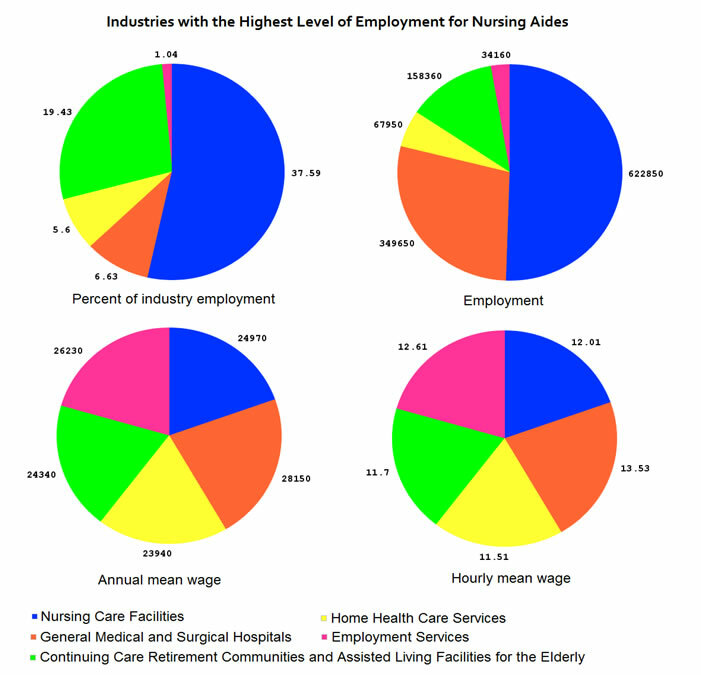 According to the BLS report, as of May 2017, nursing care facilities offered the highest concentration of employment whereas home health care services had the lowest concentration of employment for CNAs. According to the figures provided by the Bureau of Labor Statistics, in May 2017, New York employed the highest number of CNAs while Pennsylvania employed the lowest. According to the reports of the BLS, employment per thousand jobs in Rhode Island was highest, i.e., 21.63 while it was lowest in Arkansas, i.e., 15.75 (as of May 2017). Conduct the preliminary interview of patients and greet them. Nursing assistants collect vital information about the patient’s condition including height, weight, respiration, pulse rate and blood pressure. CNAs take care of the patient’s personal hygiene which includes- shaving, bed bath, and nail care, etc. Interact with and observe the residents, and report health issues to the supervisor. Keep the patient’s space clean and organized. Arrange meal trays, feed patients and record the fluid/food intake. Make beds, help toileting the patients and also empty their catheter bags. These nurses perform their jobs under the supervision of LPNs and RNs. They direct the visitors and answer the phone calls. Reposition the bedridden patients, in order to prevent bedsores. Nurse aides’ help patients walk and transport them using wheeled cart or wheelchair. They also assist in caring elderly (geriatric) patients. A nurse aide sets up all the required medical equipments and assist supervisors in medical procedures and personal care. One must possess the following skills to acquire the job of a certified nursing assistant. Excellent observation skills to identify a person’s actual health condition. S/he should be proficient enough to prioritize the work. Outstanding literacy skills so as to document the records. A CNA job aspirant should be capable to follow the encoded protocols. In-depth knowledge of elementary methodologies and infectious disorders is a must. Complete understanding of physiological issues and working system of the human body. CNA job aspirants should be capable of observing the HIPAA (Health Insurance Portability and Accountability Act) regulations. S/he should be multi-tasking and hard working. Where can you work after acquiring your certification? Becoming a CNA requires short training program that finishes in 4 to 8 weeks. Financial aid for aspirants is also available. They enjoy several perks such as dental vision, good overtime, medical insurance, retirement benefits, life insurance, AD&D insurance, paid holidays, etc. 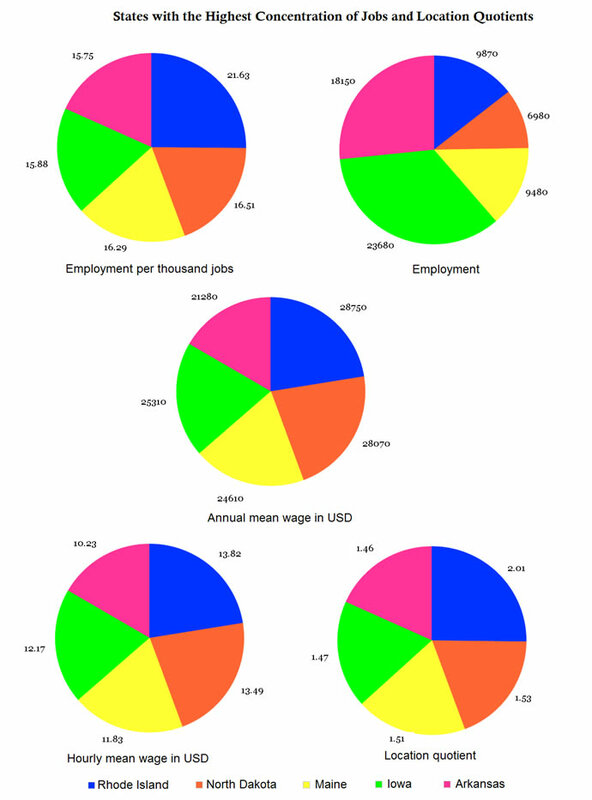 It is a recession-proof profession that remains unaffected by the national economic conditions. They have a number of working alternatives other than hospitals as they can render their services in residential care facilities, hospice, nursing homes, rehabilitation centers, retirement communities, long term care facilities, clinics and day care centers, etc. Flexible job hours make this job more lucrative. They have fewer job responsibilities than RNs/LPNs. Though the job of a nursing assistant is gratifying, it demands hard work and ability to face challenges. CNAs are considered entry-level professionals; hence, they are rewarded with an average pay scale. During emergencies they might have to work in night shifts as well. Long working hours make this job very tedious. In order to get promoted, CNAs need to take additional training courses. This physically demanding job requires proper care of bed-ridden patients. They have to assist the patients in their day to day activities which make this job quite taxing and strenuous. Back injuries are quite common in this profession. CNAs come across different kinds of patients. They have to handle their aggressive and inappropriate behavior calmly. Nursing assistants are exposed to the risk of several contagious diseases.